Rhythmical auditory stimulation can be used successfully in the rehabilitation of motor function in patients with motor disorders. 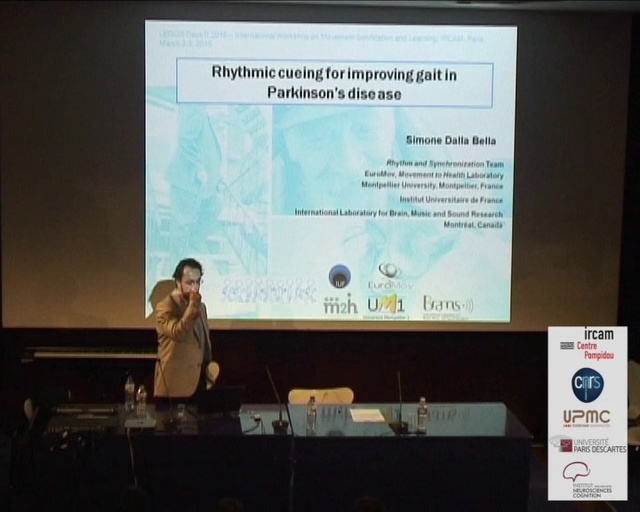 A prototypical example is provided by dysfunctional gait in patients with idiopathic Parkinson’s disease (IPD). Coupling steps to external rhythmical cues (the beat of music or the sounds of a metronome) leads to longterm motor improvements such as increased walking speed and greater step length. These effects are likely to be underpinned by compensatory brain mechanisms (e.g., cerebellarthalamo-cortical regions), which are also involved in perceptual and motor timing. Thus, parallel improvement in timing tasks is expected in IPD beyond purely motor benefits. In keeping with this idea, data will be presented that show beneficial effects of auditory cueing in IPD in both perceptual and sensorimotor timing tasks. Particular attention will be paid to individual differences in timing abilities in IPD as a way to drive cueing-based therapy, and to technological solutions which allow 1) to assess those individual differences, and 2) to implement individualized cueing-based programs.